Geoffrey J. Seitz, Violinmaker, supplies fine stringed instruments to players of all levels, from novices to virtuosi, from amateurs to professionals. We provide courteous, professional service of the highest quality and consideration. We cater to symphony professionals, community orchestra members, teachers, students, classical players, jazz players, congregational musicians, country fiddlers, occasional hobbyists, and the merely curious. 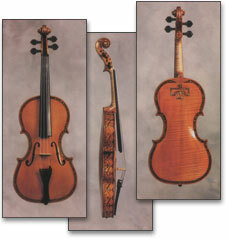 Our specialties are violins, especially old violins, violas, cellos, basses, and bows. We perform expert repair, restorations and appraisals. We buy, sell and trade stringed instruments, including some fretted instruments. Our 1930's Art Deco one-story building is located in the historic Carondelet District of South St. Louis. Stop by and visit our gallery of fine vintage instruments. We are open Monday through Friday from 9:30 am to 5:30 pm and between noon and 4:00 pm on most Saturdays.